Harvesting ambient mechanical energy or sensing the mechanical signals based on nanomaterials for self-powered and flexible systems can provide potentially revolutionary advancements in energy technologies. Piezoelectric nanogenerators/sensors, which can be fabricated using nanowires with none-centrosymmetric structure (such as ZnO and GaN or polarization domains (BaTiO3, PbZrxTi1-xO3, and P(VDF-TrFE), etc. ), have been widely demonstrated for applications in wearable electronics, implantable devices, wireless transmitters, etc. Compared to one-dimensional (1D) nanowires, two-dimensional (2D) piezoelectric nanomaterials such as molybdenum sulfide (MoS2), hexagonal boron nitride (h-BN), and tungsten diselenide (WSe2) might have the morphological advantages in constructing flexible nanogenerators. Reports have shown that only monolayered MoS2 and h-BN, or a specifically stacked bilayer form of WSe2, exhibit significant piezoelectricity. However, precise fabrication of monolayers or specific bilayer 2D nanomaterials with traditional methods such as chemical vapor deposition (CVD) or recrystallization is still challenging. Our paper reports a piezoelectric nanogenerator/strain sensor based on lead (II) iodide (PbI2) nanosheets with the shape of two-dimensional (2D) structures, of which the piezoelectricity is not aﬀected by the number of layers. 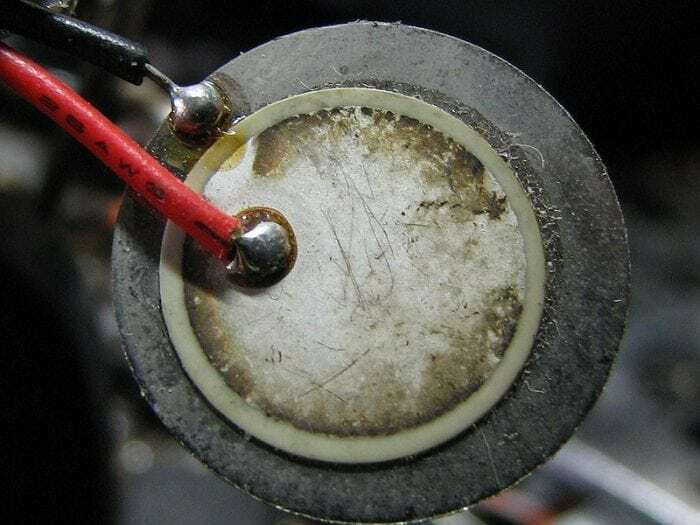 A typical 2D piezoelectric device fabricated with 3 layers PbI2 nanosheets has recorded peak values of open-circuit voltage, short-circuit current and loading power as 29.4 mV, 20 pA, and 0.12 pW, respectively, and also possess good charging and integration capabilities. Moreover, these devices can be applied as self-powered strain sensors, with high sensitivity and excellent stability. For fabricating a 2D piezoelectric device, firstly, the high-quality PbI2 nanosheets are fabricated with a simple recrystallization method, then the formed PbI2 nanosheets are deposited upon the PET substrate and were dried by N2 gas, and finally, Au electrodes are deposited on two ends of a PbI2 nanosheet, with a gap of 10 µm, that is, the piezoelectric devices are constructed. Generally, the fundamental working mechanism of the 2D piezoelectric device is based on the variations of piezoelectric potential caused by changing the electrical dipoles within the PbI2 nanosheet and the Schottky contact between PbI2 nanosheet and Au electrode, which allows our 2D piezoelectric device to convert mechanical strain to electrical outputs/signals. Polarity-switching tests are also conducted to conﬁrm that the measured output signals are not the artifacts from the measurement system. The electricity generated by our 2D piezoelectric device can be accumulated with an equivalent loop circuit. Furthermore, the electrical output is enhanced by integrating several 2D piezoelectric devices, which may extend the potential suitable applications. Moreover, our 2D piezoelectric device can be used as a self-powered strain sensor by measuring the transferred charges and open-circuit voltages. The rough gauge factors for our strain sensor is about 10 to 25, It should be noted that the gauge factor for a graphene strain sensor is only about 2. Our work provides new knowledge and strategy for ﬂexible energy harvesting or strain sensing devices based on 2D structures. These findings are described in the article entitled Lead iodide nanosheets for piezoelectric energy conversion and strain sensing, recently published in the journal Nano Energy. This work was conducted by Huaibing Song from the China University of Geosciences, Ilbey Karakurt, Minsong Wei, Nathaniel Liu, and Junwen Zhong from the University of California Berkeley, and Yao Chu and Liwei Lin from the University of California Berkeley and Tsinghua-Berkeley Shenzhen Institute. Huiabing is a research scientist at the China University of Geosciences. Ilbey, Minsong, Nathaniel, Yao, and Junwen are research scientists at the University of California Berkeley. Liwei Lin currently serves as Chancellor’s Professor of the Department of Mechanical Engineering at the University of California at Berkeley, and Co-Director of the Berkeley Sensor and Actuator Center. Professor Lin received his B.S. (1986) in Power Mechanical Engineering from the National Tsing Hua University in Taiwan, and then received his M.S. (1991) and Ph.D. (1993) degrees from UC Berkeley in Mechanical Engineering. After graduation, Professor Lin held the position of senior research scientist at BEI Electronics Inc. He also served as associate professor at the National Taiwan University and assistant professor at the University of Michigan before joining the faculty at UC Berkeley in 1999. Professor Lin also held the position of vice chair of graduate study within the mechanical engineering department from 2006-2009. Professor Lin’s research interests and activities at UC Berkeley include MEMS, NEMS, Nanotechnology, design and manufacturing of microsensors and microactuators, development of micromachining processes by silicon surface/bulk micromachining, micro moulding process, and mechanical issues in MEMS such as heat transfer, solid/fluid mechanics and dynamics. Professor Lin is the co-inventor listed on 14 patents in MEMS and has authored or co-authored 90 journal publications and more than 130 refereed conference proceedings. Since 1996 he has graduated 17 Ph.D. and 25 M.S. students.